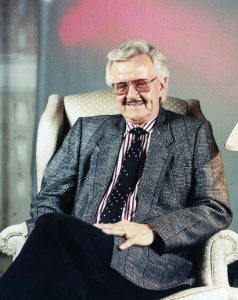 J. D. Sumner was a Southern gospel singer with a booming bass voice, as well as a prolific songwriter, who performed in various groups during his lengthy career, including the Blackwood Brothers and the Stamps. Sumner was a close personal friend of Elvis Presley, whom he met when Elvis was only a teenager. He and the Stamps recorded and toured with Presley as his backup singers through most of the 1970s. In addition to his artistic accomplishments, Sumner had a flair for the business side of music. He helped establish gospel music as mainstream American music. John Daniel Sumner was born on November 19, 1924, in Lakeland, Florida. He began singing in a quartet at his local church when he was eight years old. In the early 1940s, Sumner joined the Georgia-based Sunshine Boys. This group sang cowboy songs and spiritual songs in movies and on the radio. In 1954, Sumner joined the Memphis-based Blackwood Brothers Quartet after that group’s bass and baritone singers were killed in a plane crash. Performing with this group until 1965, Sumner established a firm reputation as a uniquely talented bass singer. Sumner and the Blackwood Brothers performing “Hide Me, Rock of Ages,” showcasing J. D.’s bass vocals. 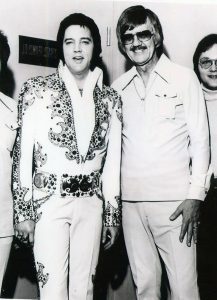 Early in his gospel career, Sumner met a high school student named Elvis Presley, who was a huge fan of gospel music and often attended gospel concerts. The two singers struck up a friendship that would last the rest of Elvis’s life. When Elvis’s mother died in 1958, Sumner sang at her funeral along with the Blackwood Brothers. During his stay with the Blackwood Brothers, Sumner and James Blackwood helped to establish and promote the National Quartet Convention, the largest annual showcase and festival of Southern gospel music. He and James also founded the Gospel Music Association, in 1964. J.D. Sumner along with Willie Nelson and members of the Stamps quartet at the Willie Nelson Museum. While still singing with the Blackwood Brothers in 1962, Sumner took on the added responsibilities of managing the Stamps Quartet, developing them into one of the top gospel groups in the country. In 1965, he left the Blackwood Brothers to become the bass singer and leader of the Stamps. After Sumner took over, the group became known as J. D. Sumner and the Stamps. Their double album, Live at Murray State University, released in 1974, is considered one of the greatest gospel recordings. J. D. disbanded the Stamps in 1980. J. D. Sumner and the Stamps performing “Just a Closer Walk With Thee” and “Old Brother Noah” in the 1960s. J.D. Sumner with his buddy Elvis Presley. Elvis recorded numerous gospel songs during his career, and he frequently incorporated gospel sounds into his secular music. He often referred to Sumner as his favorite gospel singer. Elvis hired J. D. and the Stamps as his full-time backup singing group in late 1971. The “King” recorded and toured with the all-male Stamps—as well as the female vocal group Sweet Inspirations—for the remainder of his life. The Stamps can be heard on most of the records Presley made from 1972 to 1977. J. D. Sumner can be heard as the ultradeep “way on down” on Elvis’s 1976 recording of “Way Down,” which was Presley’s last released single before his death on August 16, 1977. The Stamps sang on stage with Elvis through his last concert on June 26, 1977, in Indianapolis. During shows, Elvis sometimes asked J. D. to repeat low notes that he especially liked. Elvis in an impromptu gospel session with J. D. and the Stamps in the 1970s. Elvis on stage in the ‘70s performing “How Great Thou Art” with J. D. and the Stamps and the Sweet Inspirations. Elvis’s last released single, “Way Down,” highlighting J. D.’s deep voice from 1976. Sumner sang at Presley’s funeral in August 1977. An album released by J. D. and the Stamps after Elvis’s death, Elvis’s Favorite Gospel Songs, was nominated for a Grammy in 1978. Sumner also wrote and recorded a tribute single to his friend titled “Elvis Has Left the Building” in 1977. Sumner credited Elvis with saving his career, his marriage, and his life, noting that Presley frequently urged him to get help for his alcoholism. Sumner eventually heeded Elvis’s advice, got the help he needed to quit drinking, and turned his life around for the better. After disbanding the Stamps, Sumner formed a new gospel group called Masters V with members of other groups. Masters V was awarded a Grammy in 1981 for Best Traditional Gospel Performance. When Masters V broke up in 1988, Sumner put the Stamps back together. He then performed with this group for the rest of his career. The Stamps performed with several other secular artists besides Presley, including Tammy Wynette, Ronnie Milsap, and Jerry Lee Lewis. J. D. and Masters V singing “We Sure Do Need Him Now” in the 1980s. The Stamps’ recording of J. D.’s original composition “The Old Country Church,” from 1971. Sumner died of a heart attack after a concert on November 16, 1998—just three days shy of his 74th birthday. He was inducted into the Gospel Music Hall of Fame in 1984. 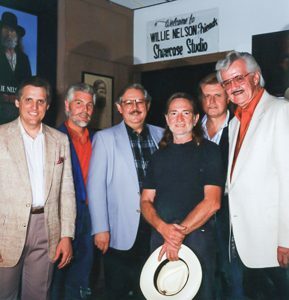 The Stamps were inducted into the Gospel Music Hall of Fame in 1998. J. D. Sumner of the Stamps Quartet talks about Elvis. Elvis Australia. Alan Kendall. The story of J. D. Sumner & the Stamps. Absolutely Gospel. May 2, 2016. J. D. Sumner, with Bob Terrell. Gospel Music Is My Life. Impact Books, 1971.